as of monday morning, i was down 2 lbs from my 5 days of being on the challenge. i don't feel great about some of my choices this week, though. i'm really thinking i want to go back to weight watchers meetings - i liked it better. and frederick has the monthly pass thingy. i only have 'til friday left working for massey. it seems weird, but i'm excited about the job change. today is my poppaw's birthday, and also the anniversary of the death of one of DMB's founding members, LeRoi Moore. been thinking about my favorite saxophonist all day. 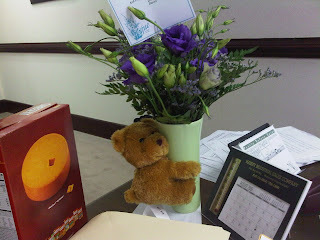 EDIT: my hubby sent me flowers today, just because. he's kinda awesome like that. Awww I love them. Kinda sad I'm not there to enjoy the view. Look at you two and your marital bliss! Isn't Daniel just perfect? ;) Lucky girl! And yes, the pass thing is great - you get to go to meetings and still have online privileges. You should go for it! Congrats on the loss! Woohoo for you. 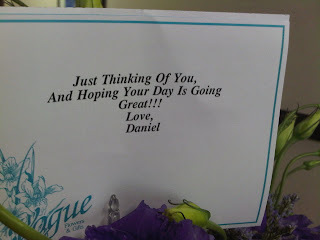 Dude, what a sweet husband to send flowers for no reason. Sometimes there are good reasons and my hubby still does not send flowers. You have a real gem.